Seattle Lodging at the Chambered Nautilus Bed and Breakfast Inn. Seattle Washington WA. This elegant 1915 Georgian Colonial home is perched on a peaceful hill in Seattle's University district, overlooking the Cascade Mountains. A short walk from the University of Washington campus and minutes from the downtown attractions. Shops, restaurants, and parks are nearby. Rooms are spacious, quiet, and extremely comfortable. All are furnished with antiques, and all have private baths, private phones with data ports, and TVs. Creature comforts include, down comforters, soft cozy bathrobes, bottled water, and teddy bears. Many rooms have porches, fireplaces, and suites have a private entrance, small kitchens and VCRs. Start the day with a fabulous full 3-course gourmet breakfast served in our dining room or on our sunporch. Relax with a book from our shelves, sip tea by the fireplace, or eat fresh baked cookies on the sunporch. 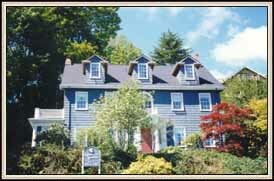 This and other Seattle Bed and Breakfast Inns can be found here online in The Register.